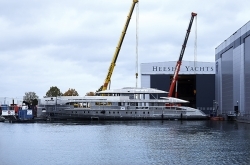 Dutch shipyard Heesen has announced that the hull and superstructure of the diesel-electric YN 19150 Project Electra yacht have been joined together at the company’s facility in Oss, the Netherlands. Electra is the second in the 50m 5,000 class. Based on the design of its predecessor – YN 17850 Home – Project Electra, which is available for delivery in April 2020, uses a Fast Displacement Hull Form and hybrid propulsion solution that, according to the yard, “is quieter and more fuel efficient”. It is also said to offer “cost-reducing benefits and flexible power management, as the yacht can be operated in four different cruising modes”. In Hybrid mode, the vessel can be operated at up to 9kts at noise levels of 46dB. Two 127kW water-cooled DC electric shaft motors of 127kW power the yacht. In Economic mode, speeds of 9-12kts with the main engines on and generators off are possible. At 12kts the yacht burns 98 liters per hour, making it suitable for longer passages. In Cruising mode, speeds of 12-15kts are possible as the diesel engines drive the yacht’s propellers and the generators provide the hotel load. In Boost mode a maximum speed of 16.3kts is achievable as the generator-powered shaft motors are brought into service alongside the main engines to provide extra power. The vessel’s exterior has been designed by Frank Laupman of Omega Architects and its interior by Cristiano Gatto. As many as 12 guests can be accommodated in five lower deck suites and a master stateroom on the main deck.